If you are a landlord, you will understand that you have certain responsibilities for which you are accountable under the law. These include fire, health and safety regulations; certifications for energy performance, gas and electrical equipment, as well as specific duties with respect to your tenant(s). Further to this, as a landlord, you are obligated to manage your finances and accounts for the purpose of tax reporting. Her Majesty’s Revenue and Customs’ Making Tax Digital initiative is now in effect for VAT registered businesses earning above the threshold (£85,000) and will soon become ubiquitous for all businesses in England and Wales – currently set down for April 2020. What this means, is that all businesses will be required to submit mandatory quarterly tax returns (as well as the standard annual return) to HMRC as of this date, through the use of a Government recognised and sanctioned cloud accounting software, including landlords. Migrating your finances may seem like a daunting task, and there will be a number of changes felt by businesses with established bookkeeping and tax lodgement systems already in place, but before we get into the specifics, Tax Agility, London’s local accountants for small business, will take a brief look at the various taxes applicable to landlords. What taxes are landlords liable for? Income Tax – If an individual lets property in the UK, they are subject to income tax. The first £1,000 of income from property rental is tax-free and known as a ‘property allowance’. For individuals letting out a property that they personally own, rental income has to be reported if it is 1) £2,500 to £9,999 after allowable expenses or 2) £10,000 or more before allowable expenses. National Insurance – This is required to be paid by landlords who are deemed to be ‘running a business’. A landlord is deemed to be ‘running a property business’ if 1) being a landlord is their main job, 2) they rent out more than one property and 3) they’re purchasing new properties for the purpose of renting them out. If a landlord meets these requirements and is categorised as running a business under such parameters, they are liable for Class 2 National Insurance, as long as their annual profits exceed £5,965. Stamp Duty Land Tax (SDLT) – This is a lump-sum tax that is payable when buying land or property that amounts to more than a certain value. The current SDLT threshold is £125,000 for residential properties and £150,000 for non-residential land and properties, with rates increasing depending on the value of the property. Capital Gains Tax – Landlords will be liable for Capital Gains Tax (CGT) if they sell a property that has increased in value. The tax is only payable on the profit you have made, not the total amount received. Types of properties that are incorporated under CGT include buy-to-let properties, business premises, land and inherited property. Value Added Tax (VAT) – Lease or sale of residential and commercial properties is usually VAT exempt, but a commercial property owner may ‘opt to tax’ the property for the purpose of recovering VAT charged to the property. Instituted in 2018, HMRC has integrated their Making Tax Digital scheme sequentially with respect to the degree of difficulty some businesses might encounter when migrating their finances to online cloud accounting platforms. In essence, Making Tax Digital is an initiative designed to make tax administration more effective, efficient and easier for taxpayers through a fully digital tax system. Instead of filing an annual self-assessment tax return, taxpayers and businesses are required to keep records digitally and send quarterly updates of their finances to HMRC. They will also need to send in a final report at the end of the tax year, together with a claim for any reliefs or allowances. Making the transition to the cloud is not as complicated as you might think, and many of the software platforms available are incredibly intuitive and straightforward. 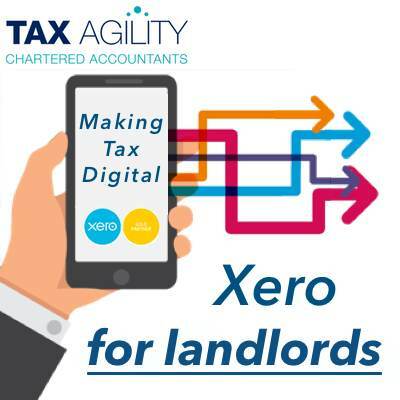 Digital tax accounts are accessed via a secure online portal where a property business or individual landlord can see all of their tax details. All of the records will be ‘cloud-based’, meaning that they reside online, and are accessed through commercially available third-party accounting software and mobile apps. Many of these softwares provide easy to understand insights into the financial health and positioning of businesses, however, using them can often be a burden for landlords and property ownership businesses that don’t have the time to also manage their own accounting functions. This is where Tax Agility can help. As Gold Partners of Xero, one of HMRC’s recognised MTD accounting software, we have a proven track record of managing finances and accounts on the cloud and are also able to assist you with the move to digital. Does it matter if I am a residential or commercial landlord? It might. If you’re an incorporated property lessor or landlord with an income over £85,000 that has opted in for VAT, you will need to be MTD-compliant from 1 April 2019. If you are a residential landlord, then you won’t have to become MTD-complaint until April 2020, when MTD for income tax comes into effect for all businesses. What if I rent out multiple properties? Will I have to report for each property or just the business as a whole? Where multiple properties are held within a business or by an individual landlord, income and expenditure only has to be recorded and submitted for the property business as a whole and does not have to be allocated individually. However, it is good practice in such circumstances to keep a record of the income and expenditure of each property so as to keep comprehensive records and avoid a possible audit by HMRC. What if I have joint ownership of the property? The partnership, rather than each partner, will be responsible for the requirements of Making Tax Digital. A nominated partner will fulfil these obligations. When the end of year declaration is made, the nominated partner will be obliged to push each partner’s share of profits to their digital tax accounts. Tax Agility has worked with Xero since 2011 as a gold partner and certified Xero adviser. This means that our clients get exclusive access to a whole host of benefits, including 25% discounts on Xero subscriptions. As experts in Xero, Tax Agility can help make your transition to Making Tax Digital as smooth as possible. Take advantage of the free 30-day trial and contact us today on 020 8108 0090.